Okay, so this is definitely the least pretty meal prep I’ve ever made and I almost didn’t post it, but I’m genuinely excited to be eating this Black Bean and Avocado Enchilada Meal Prep this week, so I set my vanity aside so you could enjoy it too. It may not be pretty, but it’s too good not to share. It would be rude for me to keep this gem of a recipe combo to myself. I first made these vegan Black Bean and Avocado Enchiladas back in 2013 and they’ve been a huge hit with everyone who has tried them ever since. The weather is warming up and the sun is shining, so I’ve really been craving the type of bright fresh flavors that fill these enchiladas. 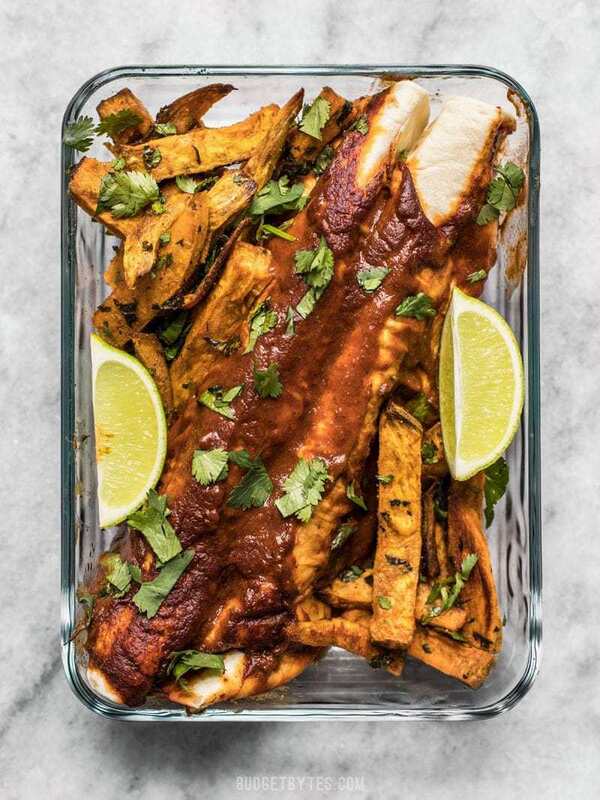 I paired them a really simple side, my Cumin Lime Roasted Sweet Potatoes, which match the enchiladas in the light and fresh flavor. This entire assembly was really easy, and I think many of you will love this combo just as much as I do. I did run into a little logistical error, which led to the less than pretty appearance of my meal prep: the tortillas I used were too long for my meal prep containers! So keep that in mind when you’re tortilla shopping, LOL. The containers pictured in the photos are the Pyrex 3-cup rectangular storage container with lid. If you’re texture sensitive, this one might not be for you. Both of these recipes do tend to get a bit soft as they are stored in the refrigerator (fortunately, this is something I actually need with my new braces!). Using corn tortillas and toasting them slightly before assembling your enchiladas can help combat the softness. Add baked enchiladas to containers, then refrigerate. 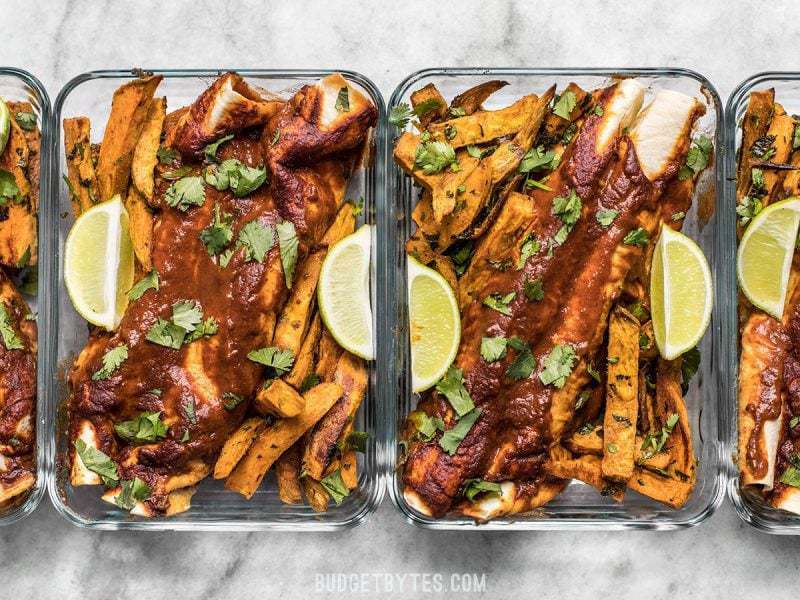 I did not squeeze the lime over the sweet potatoes after they baked, instead I added the wedges to each container so I could add the lime juice after reheating and just before eating. It tastes best when that tart juice is just sitting on top of the sweet potatoes and hasn’t really soaked in. There are two enchiladas left over. Will you have difficulty not wasting these? I won’t. They’ll 100% get eaten, whether I tack an extra enchilada onto one of the meals, or just decide to eat enchiladas twice in one day (yeah, I like them that much). Now if you absolutely need to, these can be frozen, but I’d list their freezer-friendliness at about 6. They probably won’t taste quite so bright and scrumptious, but will certainly be edible. The post Black Bean and Avocado Enchilada Meal Prep appeared first on Budget Bytes.